Welcome to "Hale Nihi Bed & Breakfast". We are located in the heart of Maui’s North Shore in Historic Paia Town, just above the Paia Town Center on Baldwin Avenue. 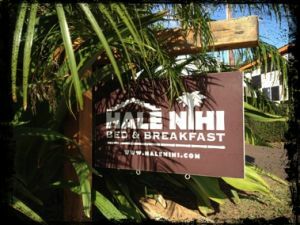 Welcome to Hale Nihi Bed & Breakfast. We are located on Maui’s North Shore, on Baldwin Avenue in Historic Pa'ia Town. Staying here at Hale Nihi B&B, you will enjoy the convenience of being within walking distance to shops, restaurants, bars, and cafes, with access to post office, bank services, and yoga studios, while also having the opportunity to visit sites such as the Great Pa'ia Peace Stupa (recently visited by His Holiness the 14th Dalai Lama in April 2007) and the world-renowned surf spot, Ho’okipa Beach Park, along with some of Maui’s most beautiful sandy beaches. Choose from either the 'Sunrise' or 'Sunset' units located on the ground floor. Each studio unit is completely furnished with private bath, complete cooking facilities including, full sized refrigerator, toaster oven, microwave, coffee maker, Dining area, Queen bed, sofa/love seat, flat screen TV, CD/DVD Player, FREE Wi-Fi, access to 24-hour movies, on site laundry, on site parking, relaxing private lanai's, fenced yard with picnic & BBQ area. As a former plantation town, Paia is rich in history. Evidence of its history can still be seen today, as remnants of the Old Pa'ia Sugar Mill still stands in the distance and sugar cane is still being grown in clear view. Staying at Hale Nihi offers you a glimpse into Pa'ia’s history with vast and expansive views of green fields as far as the eye can see with the jagged ridges and peaks of the West Maui Mountains as its backdrop.Maui’s North Shore offers something for everyone! Whether you are seeking the steady warm trade winds for windsurfing and kite surfing, the consistent ocean swells generated by storms far to the North of the Hawaiian Islands, relaxed times soaking up the warm sun on a quiet beach with calm waters or simply driving around exploring the many diverse micro climates ranging from tropical lush rain forests with natural waterfalls to the cool moon-like landscape found at the summit of Haleakala, Hale Nihi B&B offers a convenient central location as your base.